My feet crunched through the snow, making that familiar sound I thought I wouldn’t hear again until next winter. We ended our first week of this Nordic road trip up in the snow-covered hills of Telemark, Norway and it felt amazing to be back in a winter wonderland! Only seven days previous to this, we’d woken at sunrise in a supermarket car park in southern England ready to board the ferry over to the Netherlands. 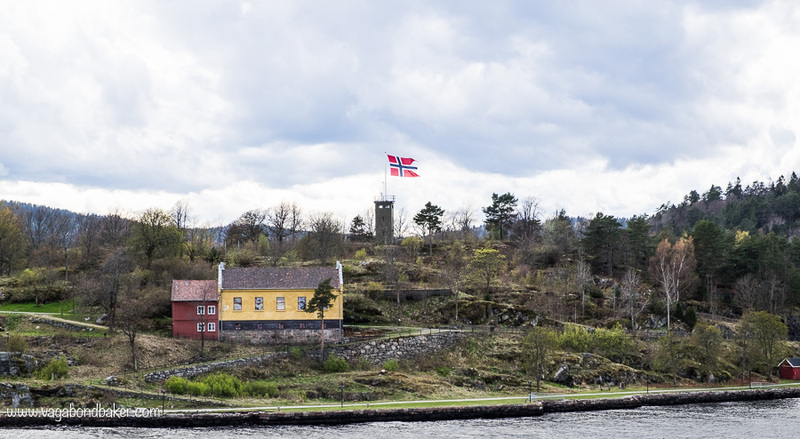 Snapshots from our first week on the road: UK to Norway! The eight-hour ferry journey had crossed over to the continent smoothly and we drove off the ship towards Rotterdam: the aim being to get to Velbert, near Düsseldorf, in Germany by the evening. It was a long drive but the roads were quiet, it was Kings Day in the Netherlands. We soon found ourselves in Germany, being thrust along the autobahns to Düsseldorf. A quiet motorhome rest area (5€ with electric) under a brick viaduct was a welcome sight after a full day travelling. 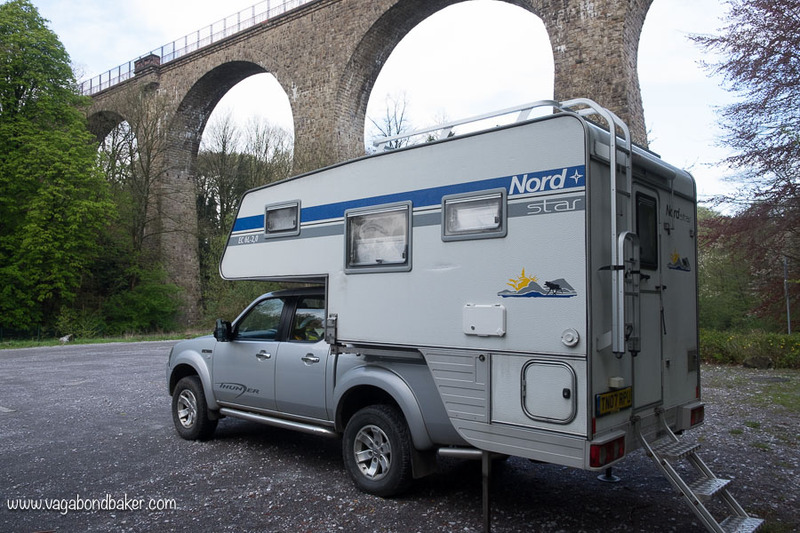 This slight detour was to visit a camera shop in Wuppertal and with the task completed we hit the road again, this time heading north to Denmark – overnighting in an autobahn rest area on route. At the Danish border the traffic was funnelled in single file through flashing lights and bollards. We were waved over to a border official who quizzed us on our onward movements then sent us on our way. It was a drizzly grey day and we travelled on the E45 to Aarhus through a fairly flat agricultural landscape. 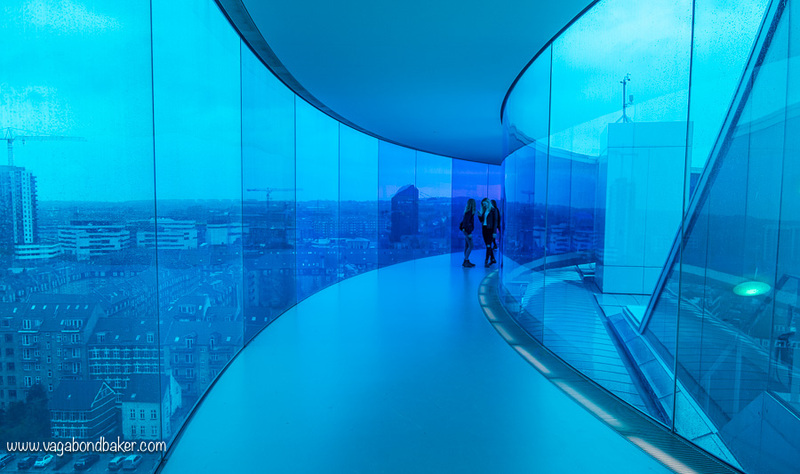 It was my idea to visit Aarhus, I’d heard good things about this Danish city yet it wasn’t until the road became more urban that I happened to mention to Chris that it was Denmark’s second largest city after Copenhagen! I don’t think he was expecting to be parking up for the night in such gritty urban surroundings. 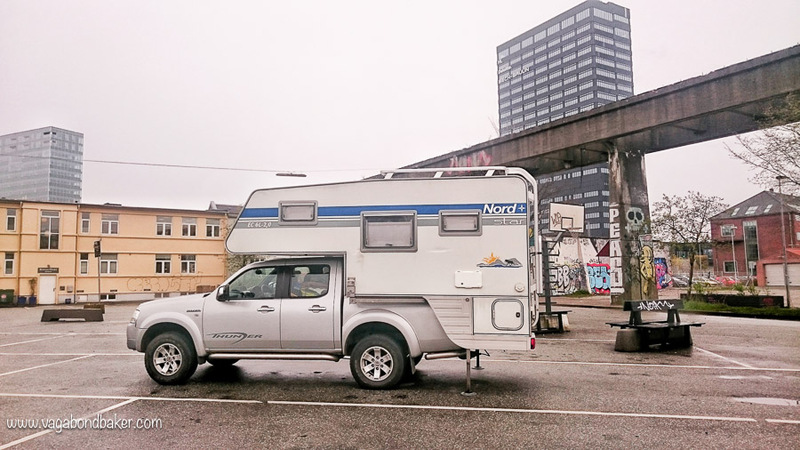 The motorhome parking (free) is just a kilometre from the centre of the city, it has room for six vans and comes complete with some cool street art. Truckers also use the car park and so it felt pretty safe, their early departures certainly didn’t wake us. It was a wet afternoon to explore the city, we took shelter in ARoS: Aarhus’s excellent art museum. The nine floors of this art gallery are based on Dante’s The Divine Comedy, and we began down in the dark basement: in Hell! The art installations throughout the gallery kept even Chris interested – he wanes quickly in museums and art galleries! I had a moment of “Blimey, aren’t I cultured: I’ve already seen this exhibition!” It was Jani Leinonen’s School of Disobedience that I’d seen in Kiasma, Helsinki in January. 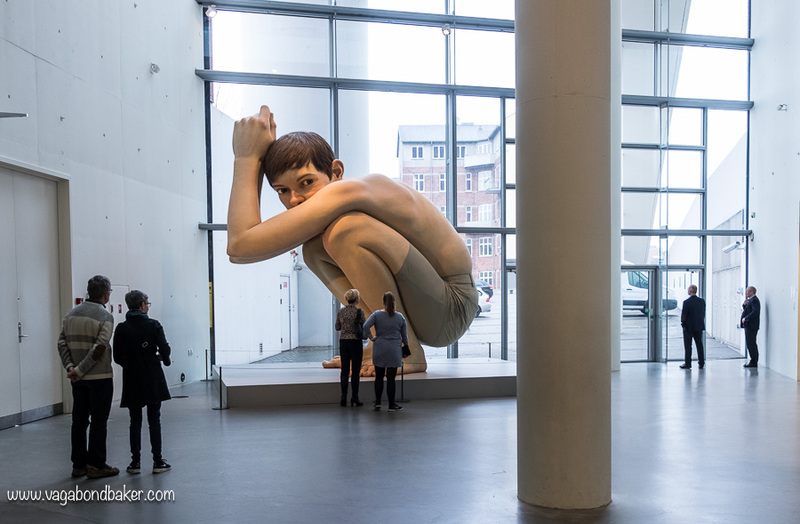 I was a little creeped out by the enormous Boy, a five metre high sculpture of a crouching boy which is unnervingly lifelike. On such a grey afternoon the Your Rainbow Panorama walkway crowning the museum added a splash of much-needed technicolour to the day. 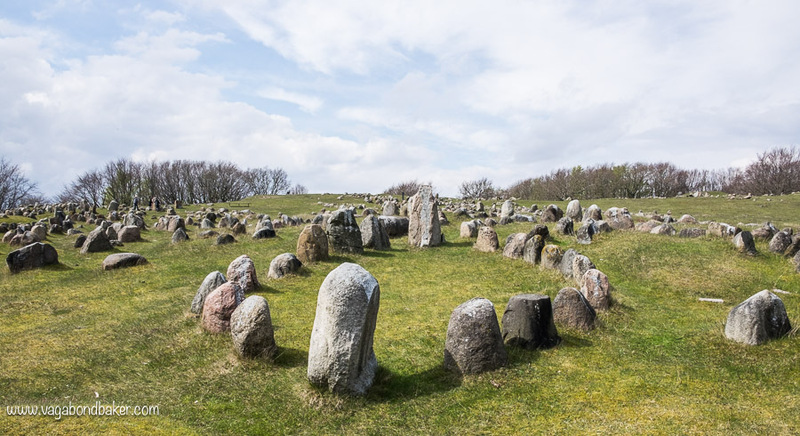 With one more night in Denmark before we were due to catch a ferry to Norway we drove north, stopping for lunch at Lindholm Høje a wonderfully atmospheric Viking burial ground just north of Aalborg. Rooks cawed in the trees circling the site; we wandered amongst the many stone rings on the hillside before eating some crackers and cheese in the van. The dead Vikings were cremated on wooden platforms within the stone boat-shaped rings until the Vikings converted to Christianity and then they were buried within the ring instead. Pretty cool stuff, especially as Aalborg was an important route for marauding Vikings heading over the sea to raid England! 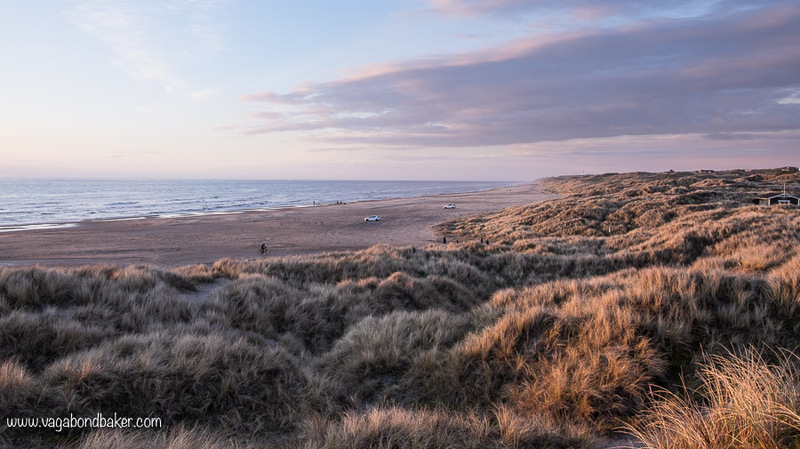 We spent the night parked up behind the dunes at Tornby Strand. Dark clouds had greeted us, we had only managed a few moody photos before rain drove us off the beach. The evening cleared and we were treated to a gorgeous sunset. 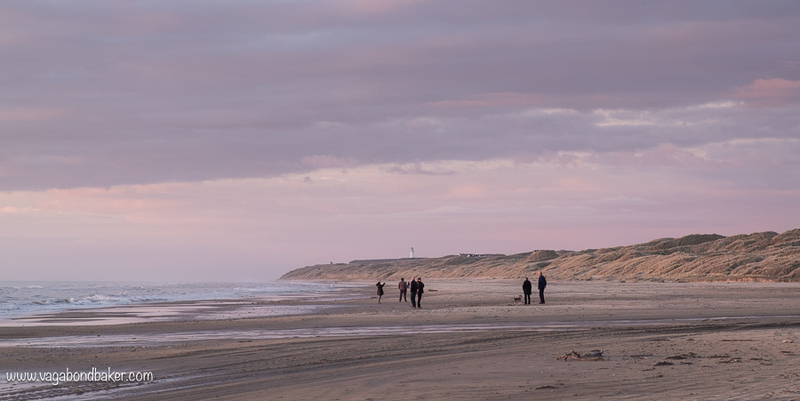 This northern coast of Denmark is really pretty. We drifted off to the sound of the waves but were woken a few hours later by a thundering car stereo and what sounded like a horde of people. Fortunately, the party moved down to the beach, and almost quiet returned. The thud thud of the rave carried over on the breeze – nostalgically reminiscent of the music festivals of my past – occasionally through the night. It was a nine hour ferry to Oslo, and we upgraded to a cabin to take advantage of a hot shower and to do a little laundry in the sink. The cabin had a window so we enjoyed the crossing in comfort, albeit under a makeshift washing line strung with undies. 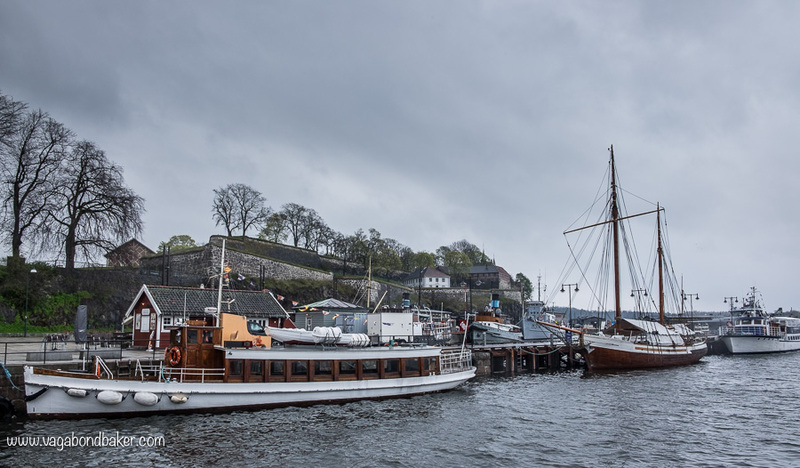 The ferry sailed up the fjord towards Oslo at its head, passing the old fortified island of Oscarsborg. We went up on deck and Oslo city came into view: the gleaming white opera house and a little flurry of glittering tower blocks. There was another brief grilling about our travels at the border as we drove off the ferry, then we joined the traffic flowing through Oslo. 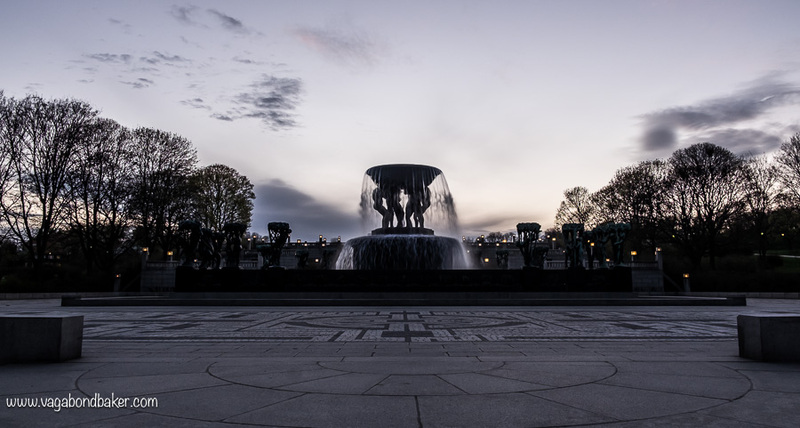 It was early evening and the Sat Nav guided us to Vigeland Park where the little car park became our spot for the night. 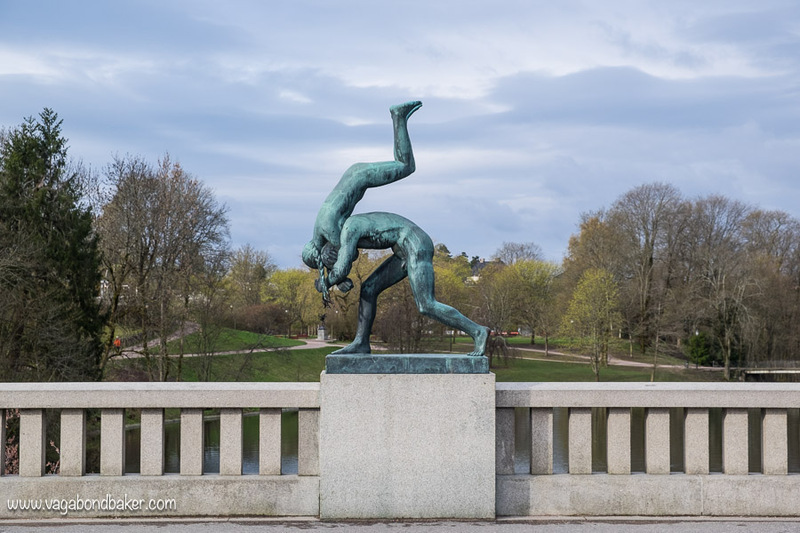 Vigeland park is a celebration of the work by sculptor Gustav Vigeland: there are 212 naked figures by the artist throughout the park: lined on bridges, perched on plinths, circling fountains and 121 of them climbing the showpiece Monolith crowning the park. We took a brief stroll around the park in the last light of the day then returned early the next morning to explore it in more depth. 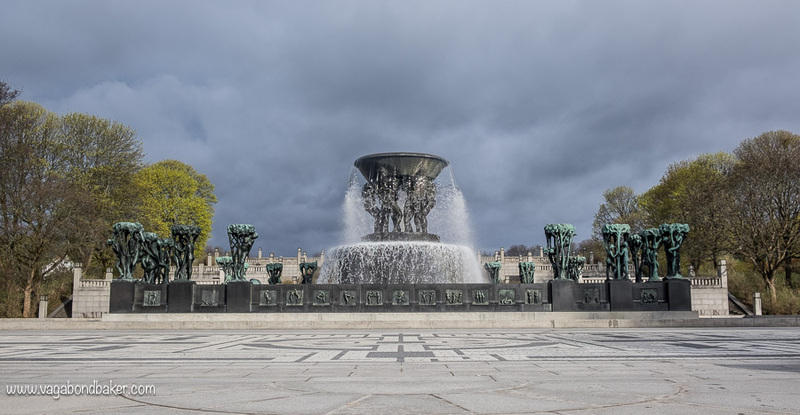 Vigeland Park is a remarkable collection of work, and it’s totally free to enjoy too. The car park fees kicked in a 9 am Monday morning so we vacated and headed across the city to the Bygdøy Peninsula, parking up for 24 hours (58 NKR : £5) in the car park opposite the Norsk Folkemuseum. 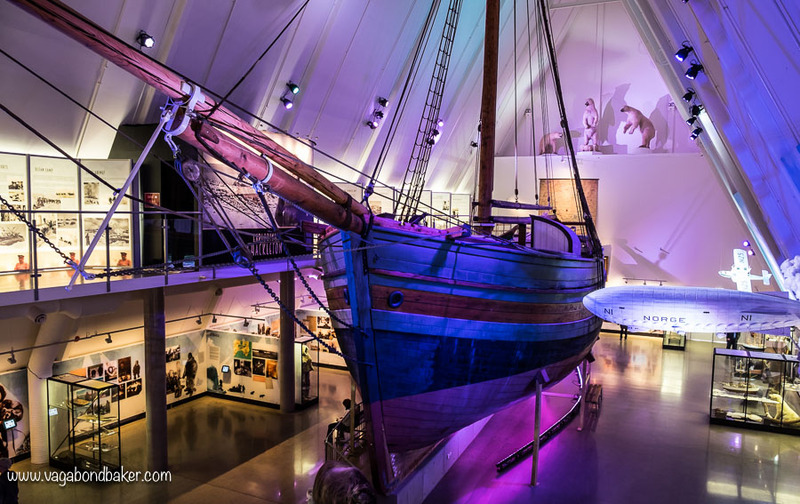 Our museum of choice however was the Viking Ship Museum (Vikingskipshuset), where the three best-preserved Viking-era ships ever found are housed. And what beauties they are, it was an absolute joy to visit this museum and see the detailed carvings on these glorious boats. All three ships were used in boat burials, this is what had preserved them, and the grave goods are also on show in the museum. I’ve written a separate post about the museum because it was a bit of a pilgrimage to see one particular ship! 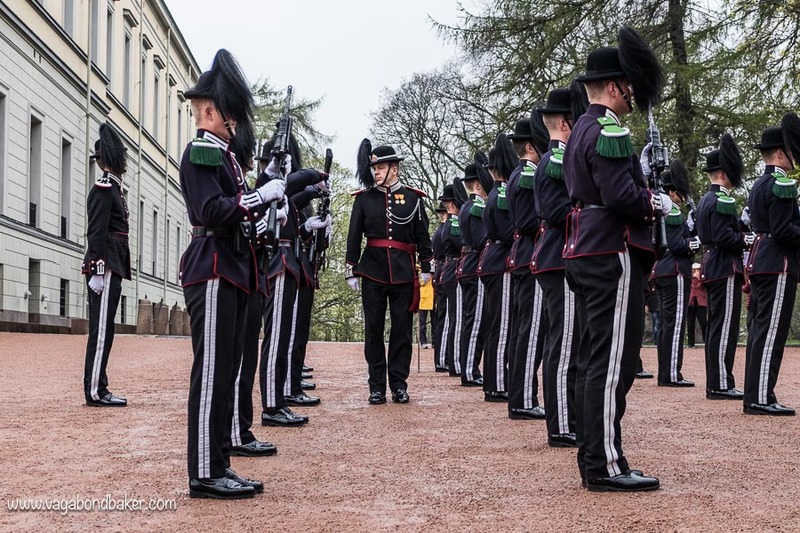 The following morning was spent wandering the city walking through to the Royal Palace, where we watched the Guards come out and do a little manoeuvre. The view back down to the city from here is fabulous. From the palace we walked along to the waterside and up into Akerhus Fortress. Footpaths wound up into the fortress and threaded through old pretty buildings. Further along the impressive Opera House drifts like an iceberg into the shore. We took to its white sloping roof: it urges you to climb, to get higher. 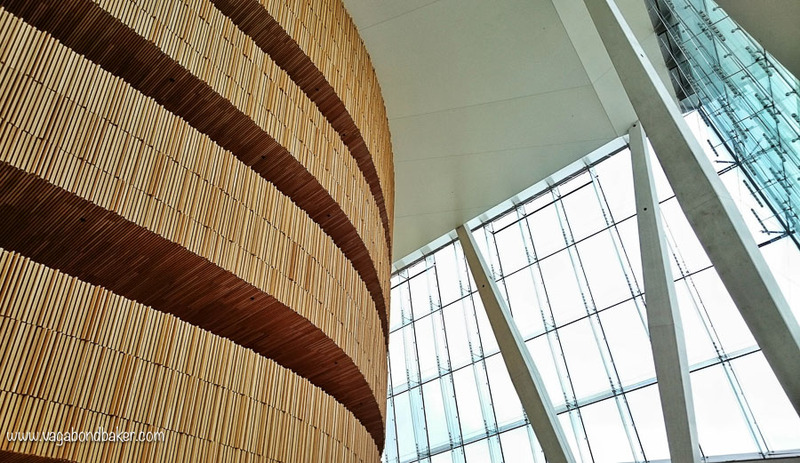 Inside the Opera House is equally stunning, the atrium is definitely worth checking out with its airy feel and waves of oak towering up. In the afternoon we visited the excellent Polarship Fram Museum – more boats – the next day, and learnt about Norwegian Polar exploration and the race for the South Pole in 1910. It was adventurous stuff, and we were able to board both the Polarship Fram and the Gjøa (the first ship to navigate the Northwest Passage). It was interesting to see the Fram, to compare it with Robert Falcon Scott’s ship the Discovery, berthed in Dundee. 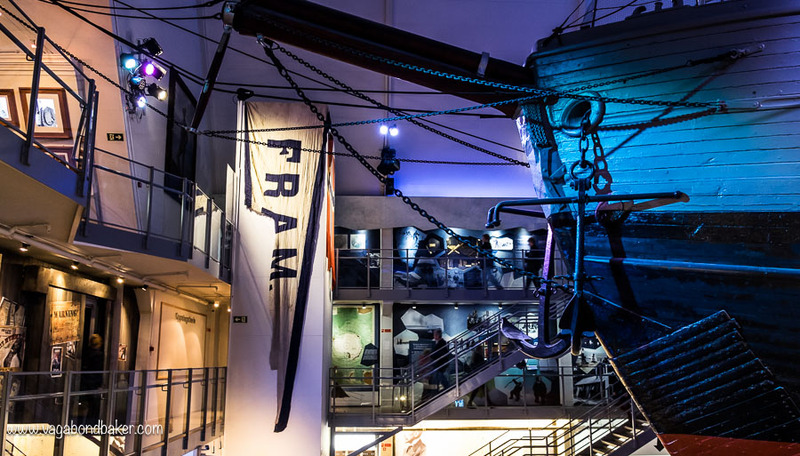 The Fram is a much more robust affair, it was designed to withstand the crush of polar ice, and it is now housed inside the museum. The evening was spent high up above Oslo in the car park for the Holmenkollen Ski Jump and Museum. The view over the city was impressive and it made a lovely spot to spend the night – so nice in fact that we stayed a second night too. 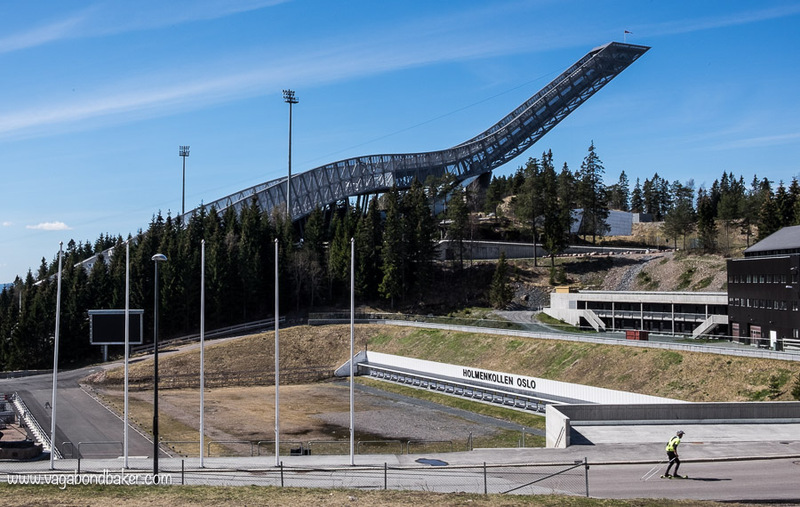 The Holmenkollen Ski Jump is the only steel ski jump in the world and it looks rather sleek and stylish glinting in the spring sunshine. It crowns the hill and can be seen from down in the city. 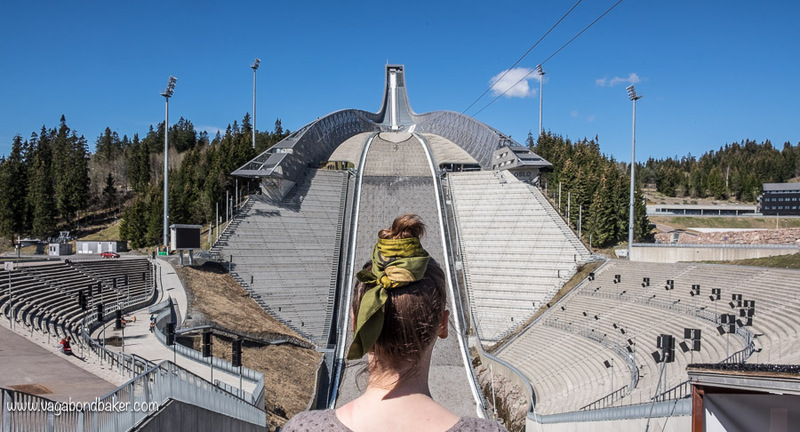 For 130 NKR you can visit the museum – 4000 years of Nordic skiing history – and take the lift up to the top of the ski jump. This is as high at you can get overlooking Oslo without taking to the air! Looking down the steep slope of the jump confirmed with me that there is no way I could be a ski jumper! Even the angled lift gave me sweaty palms as I watched the gap between the hill and myself widen. 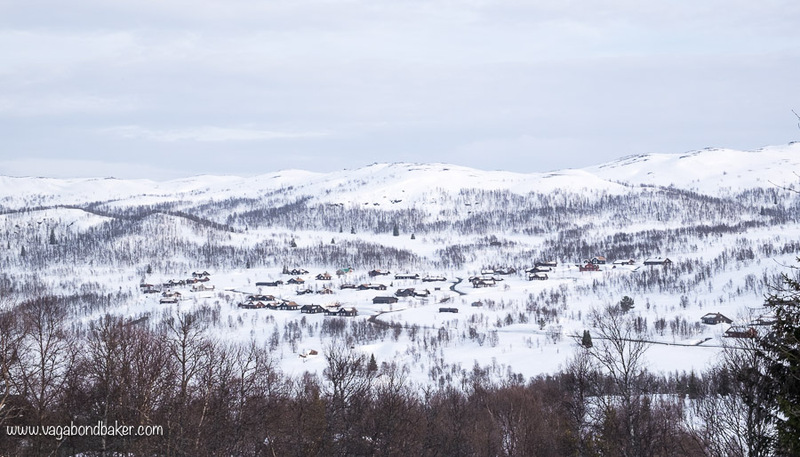 We drove up into the snow-blanked hills of Telemark the next day, slowly winding through pretty countryside scenery, to the cabin-covered hills around Rauland. The Sat Nav had no trouble finding the cabin we were aiming for, yet even so we were warmly waved up the track by travel blogger Silvia of Heart My Backpack. It’s so awesome meeting up with other bloggers, and it was very cool to meet Silvia as I’ve been reading her blog for a while and I did a guest post for her last year about Shetland. 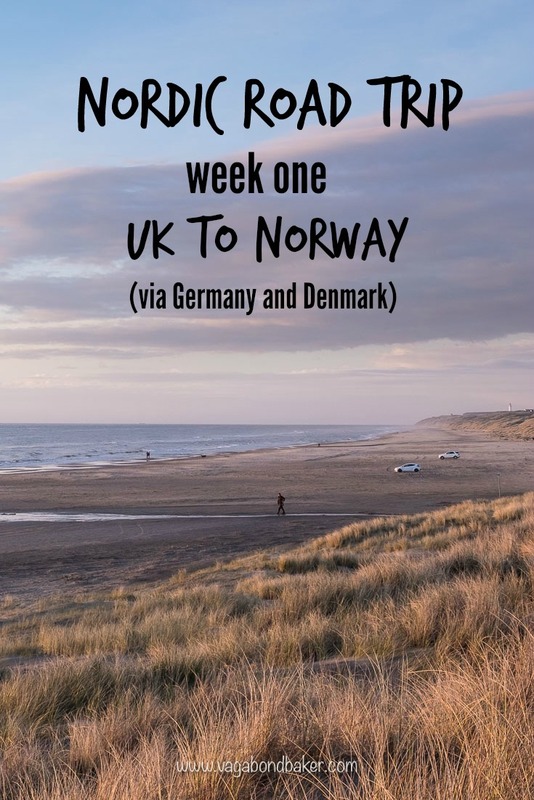 So, that was the first week of our Nordic road trip, we’d left England eight days previously and driven across four countries to reach the Telemark hills of Norway, and snow! Coming soon : Norway’s prettiest mountain and then we drive down to the beautiful south coast. 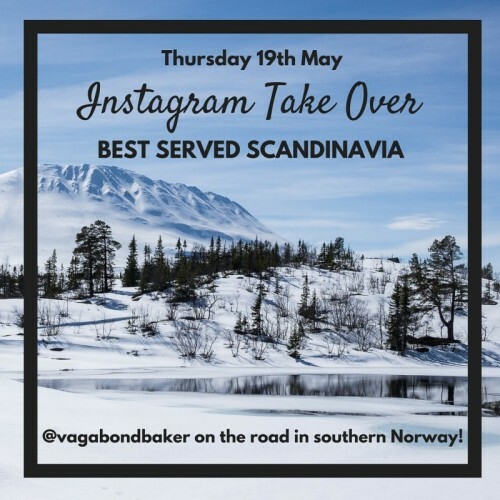 On Thursday 19th May I shall be taking over Best Served Scandinavia’s Instagram account with photos from this Norway road trip – be sure to check it out, there’s going to be some beauties, it’s one hell of a gorgeous country! Nordic Road Trip Plans and Preparations Getting ready to set off north! The Adventure Overland Show This event will have you aching to set off on an epic road trip! By Train to Copenhagen An alternative way to travel to Scandinavia! Your photos are amazing! I have always wanted to travel the Nordic countries but somehow never made it! Working for an events promotion company in London where travel and trips is a quite popular category, I am continually getting overwhelmed about which destination to pick next! The Nordic countries look a little cold but I will buy some more knitwear! You convinced me! Hello Fie! Thank you so much! 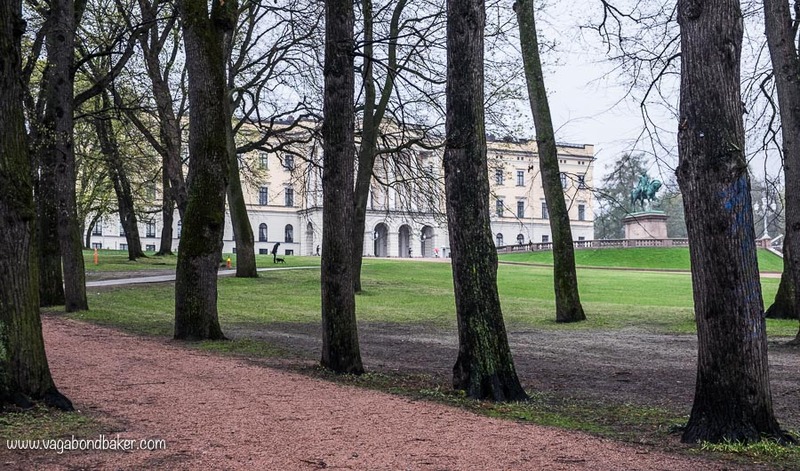 I love travelling around the Nordic countries, they had been on my travel bucket list for a while but now I am addicted to them! Yes, just wrap up warm and fall in love with them! Leaving out the couple last pictures, you really made me feel like you’re driving in the middle of the summer! 🙂 When is it exactly when you’ll come over to Finland? And what’s your plan for the South-West side of the country!? 😉 I feel so bad for being too busy to follow you guys more carefully. Every single photo on Instagram and Facebook seems just too good to be true! Yes Saana! It was so hot and sunny for our first couple of weeks, unbelievable! I’m not sure yet on exact dates, I’d imagine it would be late June/early July. We haven’t decided on our routes yet, we’re debating dipping into Sweden from here now which would set things back a bit. Sorry can’t be more specific! No worries, I have no idea about my summer schedule either! 🙂 And I sort of love it! Anyway, I will keep following your Nordic Road Trip and we’ll see how it goes. I’m sure we can manage to see each other no matter what! PS. I have my office outside now, it’s soooo hot and sunny! Hyvin! It’s grey and wet here on west coast Norway, but we’ve been treated for weeks with sunshine so I don’t mind! We shall definitely meet up, I will make sure of it! Your trip sounds great, can’t wait to read more about your adventures! 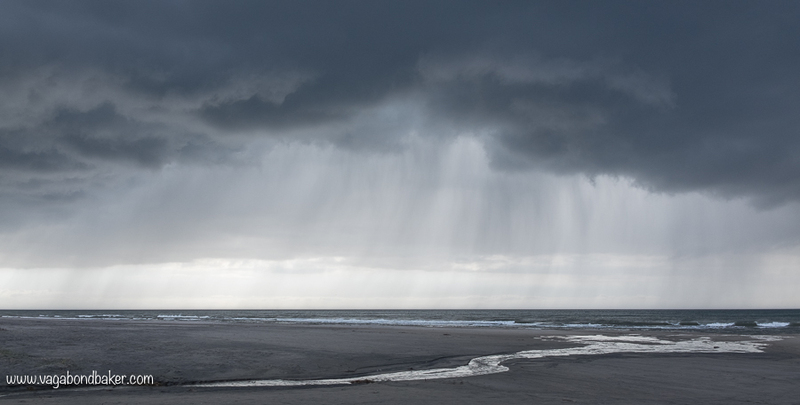 The reason I just had to leave a comment is that amazing grey picture from Denmark, where the shower curtains are hanging from the clouds above the sea. So beautiful! If I ever manage to take a picture as great as that one I will certainly frame it on my wall! Have you tried norwegian brown cheese? It’s quite special and I think it tastes different every time. Shower curtain works too! It certainly felt like a shower, albeit a cold one! Keep your eyes peeled for super dark clouds, they have the drama and if the rain is hanging from them all the better! I have eaten rather a lot of brown cheese so far, mostly on waffles – which I have a blog post about soon! 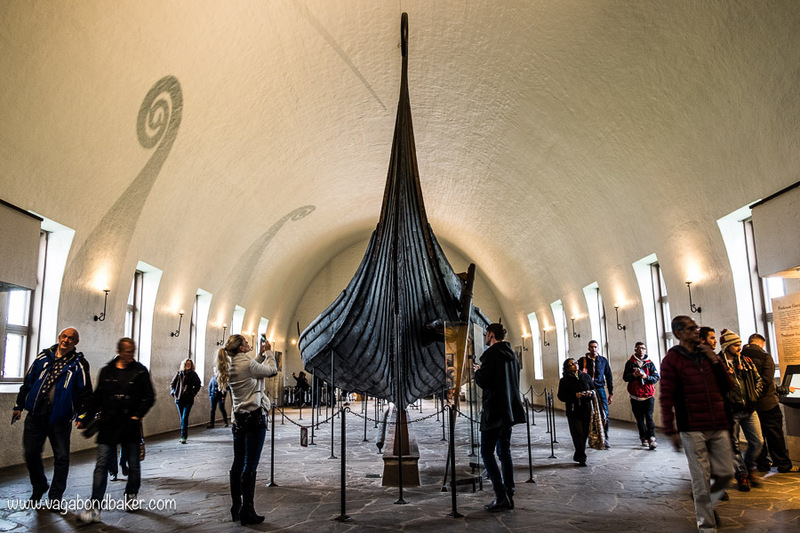 I’m really interested in the viking ships. In fact, I’m interested in anything that shows the culture and history of a people. Well done. Marvellous phtographs too! Isn’t Oslo a lovely city. 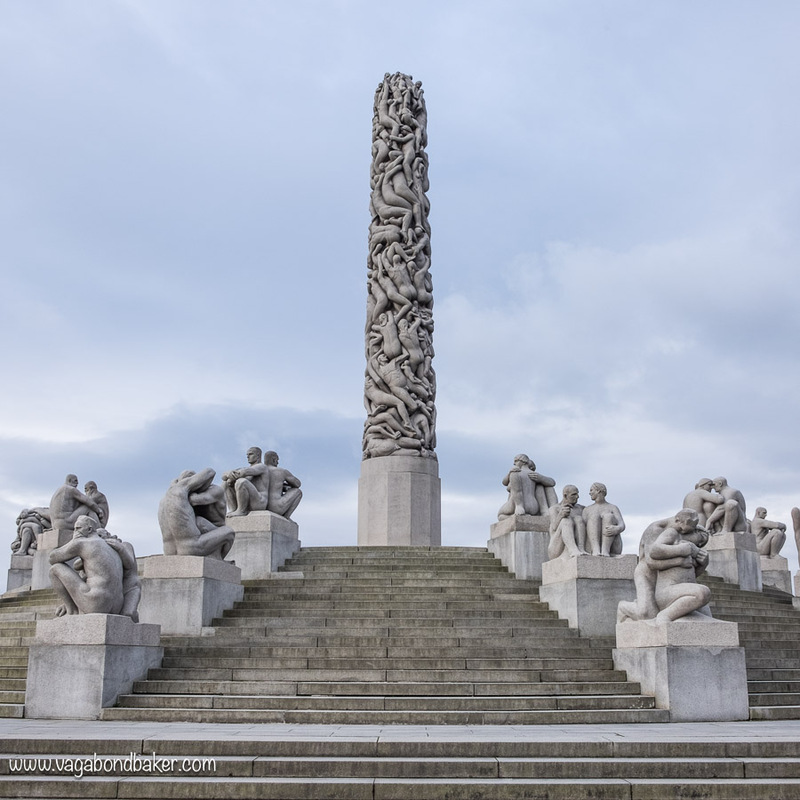 We spent hours in the park looking at the sculpture and the viking ships and Kon Tiki museums were amazing. The carvings, the cart etc…breathtaking.. Looking forward to following your journey. It was wet when we were there but great to explore! I loved the Viking ships, we never made it to the Kon Tiki museum though, that’ll have to be another trip!